Aviation Updates Philippines - The Civil Aviation Authority of the Philippines announced that it has stopped SEAir International and SkyJet Airlines from flying due to the European Union Assessment Team's various safety operations. CAAP suspended the two airlines' Air Operator Certificates (AOC). The suspension shall be effective on May 18, 2015. According to the aviation agency, it took SEAir International to task for its management structure, flight safety program, and its rules on accident prevention. CAAP cited flight data monitoring, quality assurance airworthiness, and maintenance control as one of the reasons for SkyJet Airlines' AOC suspension. In a letter sent to Mr. Avelino Zapanta of SEAir International and Capt. Teodoro Fojas of SkyJet Airlines, CAAP informed the two airline officers that both airlines were suspended due to failure of complying to the rules and regulations of the Philippine Civil Aviation Regulations (PCAR). The letter was signed by the CAAP's Director-General William K. Hotchkiss III. He stated that the negative results of the observations will be given corrective actions immediately. SEAir International currently flies to Basco, Batanes, Caticlan, Tablas, and Romblon from Manila. 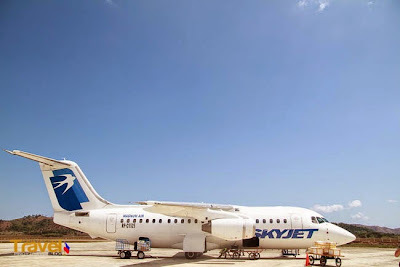 Magnum Air (SkyJet Airlines) flies from Manila to Basco, Busuanga, and Puerto Princesa. Please be informed that the comments posted below do not necessarily reflect the views of the blog, Aviation Updates Philippines, its authors, contributors, and the community. Although we have the right to fully exercise the freedom of expression at some extent, we have to use it wisely. Observing proper netiquette is a must. Dirk is an aviation enthusiast and travel blogger who is dedicated on sharing insights and analysis of the current aviation news in the present time.